There are many factors that contribute to the evaluation of land. Yet when purchasing land, engaging in property development or simply visiting places for business or pleasure, one rarely thinks about the subtle-effects of the land and the impact it can have on a person. 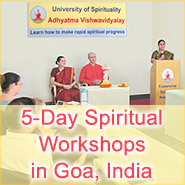 The team at the Maharshi University of Spirituality has 37 years of spiritual research experience. This research has been conducted by using aura and subtle-energy scanners along with the advanced sixth sense of its research team. Using these methods, 169 samples from around the world have been analysed so far. The soil samples were from eight types of areas, which included urban and rural areas and also popular tourist sites. It was found that most of the soil samples from around the world emitted negative vibrations. The only exception was India where some positivity was found. The main reason for the prevalence of negative vibrations in the soil samples is the effect mankind is having on the environment at the physical, psychological and spiritual levels. The soil samples from some developed nations emitted more negative vibrations as opposed to the soil samples from some developing ones. It was found that the subtle vibrations from land can vary substantially based on factors such as people’s collective thoughts and actions, for what purpose the property is used and the level of materialism prevalent in that area. It was also noted that time (era) is a factor that can influence the subtle vibrations emitted from land. While subtle vibrations from the land affect people, it is more the people themselves who live on that land that enrich or pollute it at the spiritual level. Understanding the subtle aspects of land can help in making better choices while procuring land. Spiritual practice helps to protect one from negative subtle-vibrations of land and increases its spiritual purity. There are many factors that contribute to the evaluation of land. Yet when purchasing land, engaging in property development or simply visiting places for business or pleasure, people rarely think about the subtle-effects of the land and the impact it can have . Yet, our research has shown that the subtle effects of soil and land can have a significant impact on residents. Consider the example of tourists who flock to popular places that have historical significance. They mainly view such locations from a holiday and sight seeing perspective. However, if some of these places have seen violence in the past, the environment still retains the memory of that terrible time and the unsuspecting tourist is affected by those negative subtle vibrations. This is how land and water are affected by various human activities and also the thoughts and behaviour of society. Multiple studies published in peer-reviewed scientific journals show that over 97 percent of actively publishing climate scientists agree that climate-warming trends over the past century are extremely likely to be due to human activities (NASA.gov). In our 2007 article published on the SSRF website, we provided a holistic insight into the causes of climate change. The article shared our findings through spiritual research that humanity’s effect on the Earth and the environment is not only because of physical reasons (as most people would assume), but more so at the psychological and spiritual levels. Spiritual research shows that humanity is adversely affecting the environment at the spiritual level and this is causing the Absolute Cosmic Principles of Earth, Water, Fire, Air and Ether to respond to this rise in spiritual impurity, thus causing a higher intensity of natural disasters. It is nature’s way of cleansing the planet. With the advancements in aura and subtle energy scanners, it has now become more possible for us to measure the subtle vibrations emitted by objects (living and non-living) such as soil. This gives us tangible evidence as to how humanity has affected the environment, which includes the soil and waterways along with flora and fauna. 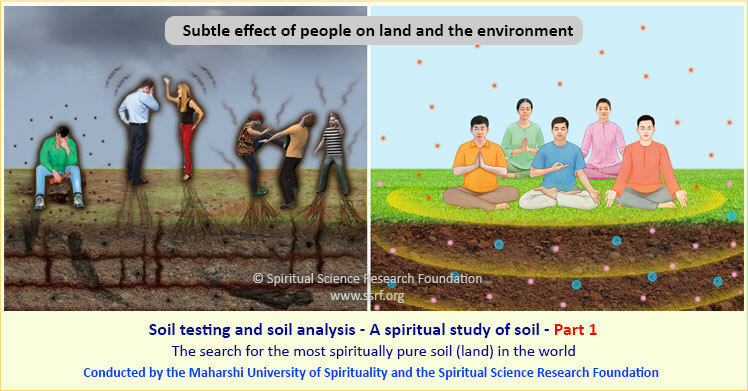 In February 2018, the Maharshi Adhyatma Vishwavidyalay (also known as the Maharshi University of Spirituality) and the Spiritual Science Research Foundation commenced a study of soil from a spiritual perspective. The purpose of the study was to analyse soil from around the world and to gauge differences in subtle vibrations based on region and location. It was designed to assess the spiritual status of the environment in the current era. We were able to obtain samples from various types of places (details given below). The subtle vibrations would be minimally impacted by other stimuli from the time of collection to the measurement of the sample. This was so that the original vibrations of the sample would be retained until measurement. 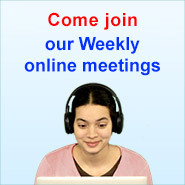 To minimise the time from collection to measurement to approximately 2 days. It is important to note that while instruments like the UTS are great spiritual research tools, a true measure and analysis of subtle vibrations from any object (which in this case are soil samples) can only be conducted via sixth sense which needs to be of a very advanced level. The following are some pertinent details with regard to the soil samples that were collected and analysed for this article. As of 25 October 2018, 169 soil samples from 24 countries have been collected and measured. The countries are listed in the table below. The average time taken from collection to measurement was 2.6 days. The samples were categorised under the following types and the table below shows the number of soil samples analysed in each category. As the samples started to pour in, one trend became quite apparent. Using the UTS, the samples were observed to be recording more negative subtle energy readings than positive subtle energy readings. In fact, the 8 samples (from the Spiritual Research Centre and Ashram) had to be excluded as their high levels of positivity were skewing the results and statistical data (such as averages) obtained from the analysis. After extracting the 8 samples of the Spiritual Research Centre and Ashram from the initial analysis, 161 soil samples remained. Some key statistics about the remaining 161 soil samples obtained from 24 countries are provided below. 5% (9 of 161) of samples showed signs of negativity as the arms of the UTS opened out to a certain extent (angle) but not completely to 180 degrees. This means that 79% of samples either had a negative IR aura or had some level of negativity associated with them. 37% (60 of 161) samples had the higher form negative UV aura. Existence of a UV aura basically means that a higher intensity of negative vibrations was detected. Only 20% (32 of 161) had a positive aura. The countries from where positive soil readings were recorded were only three in number namely, India, Croatia and Sri Lanka. In Croatia too, the only positive soil sample was from the premises of an Ashram of the Spiritual Science Research Foundation. 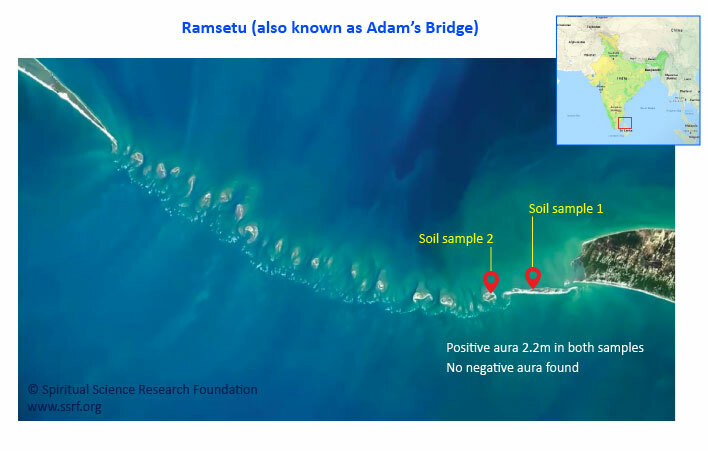 In Sri Lanka, the positive samples came only from heritage sites and places of pilgrimage associated with Lord Ram like the iconic Ramsetu region (Adam’s bridge). d. A soil sample from Nepal also showed some signs of positivity but did not actually have a positive aura. Please note : The scale for inanimate objects in terms of spiritual positivity and negativity is + / – 6% respectively. What this means is that graveyards at -10% are literally off the charts in relation to negativity and that they have a significant adverse impact on the land and the environment that can last for decades and in some cases centuries. Refer to our article on cremation versus burial. However, what did come as a surprise is that the soil samples from Religious sites recorded the second highest negative readings. Further explanation as to why this is the case is provided in Part 2 of the study of soil from a spiritual perspective. 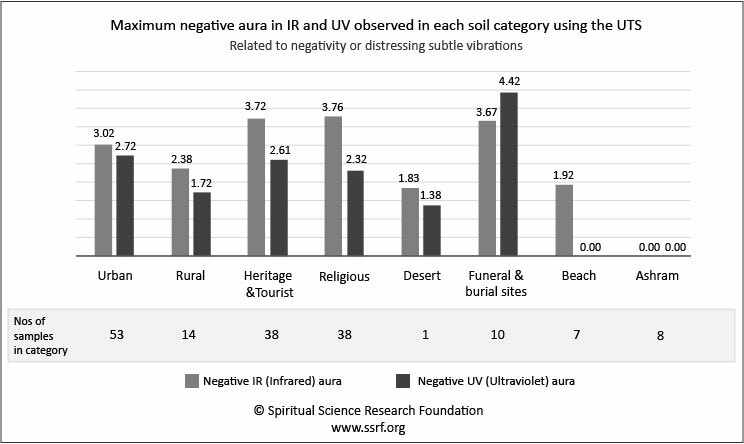 The maximum level of negative vibrations observed in Heritage and Tourist sites were almost as high as the Religious sites. In Part 2 of this study, the Taj Mahal is analysed from a spiritual perspective, whose soil samples recorded the highest levels of negativity among all heritage sites. In relation to the soil samples from Urban areas, the samples were mostly negative. The table below shows the list of cities where the soil samples had the most negative readings. It is important to note that the negativity in the urban soil samples was seen across all nations and was not related to how economically developed the nation was or whether it was a developing nation. The only country where some of the urban soil samples when tested showed levels of positivity was India. Soil samples from rural areas on average had lower levels of negativity. Soil samples from the beaches when tested showed less negativity than the soil samples picked up a few kilometres away in the adjoining urban area. 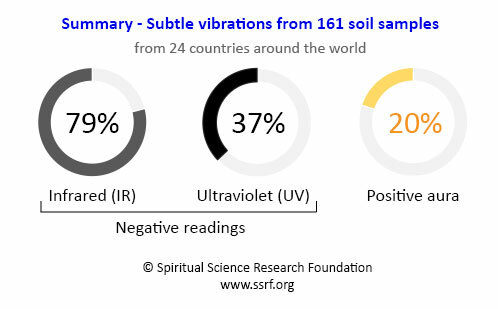 None of the soil samples from the Spiritual Research Centre and Ashram in Goa, India showed any signs of negativity and in fact registered levels of positivity not seen in any of the other samples from around the world up to now. The Taj Mahal – why does it have the most negative vibrations of all heritage sites measured so far ? How is mankind affecting the environment ? What are the implications of this study ? What are the Absolute Cosmic Principles?